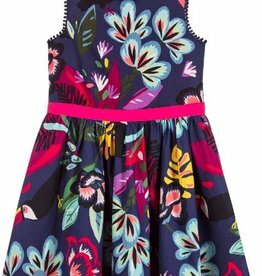 Made in soft and lightweight cotton, this navy blue tropical print dress from Catimini has a vibrant tropical print. There is a pink waistband and a concealed back zip, with a smooth cotton lining. Our Kumari Top has embroidered floral accents with a simple boxy fit. These tops are easy to pair with any type of bottom. 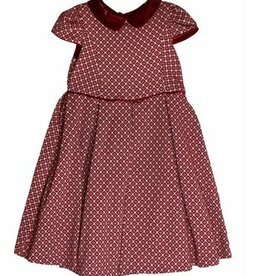 Step out in style in our Fun Fair Dress! 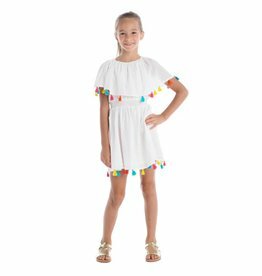 The flattering smocked waist and multicolored tassels are perfect for a day at a whimsical carnival. Beautiful floral pattern in bright colors. Surf’s up! 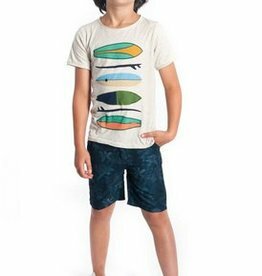 Whether you are catching waves or catching a movie, this super cool 100% cotton tee is the perfect blend of comfort and style. Arrrgh, me hearties! 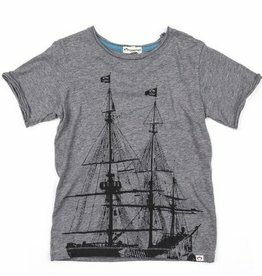 Our super cool pirate tee is perfect for sailing the seven seas and finding buried treasure. 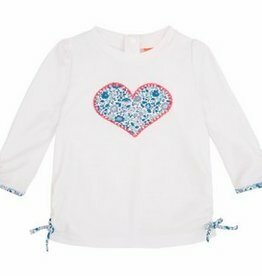 In soft, breathable slub cotton, this shirt will be a favorite for little landlubbers everywhere. Our most popular knit short is back...and this time with pockets! 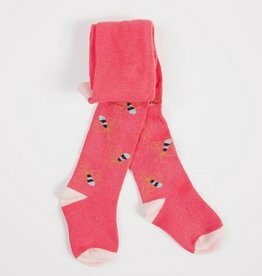 Your kid will want to wear them every day. These soft, slim fit sweat shorts have an elastic waist with a faux drawstring. 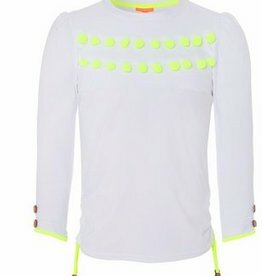 This cool long sleeve rash vest will be easy to pack, comfortable to wear, and look great for daytime exploring. Wear with matching Swim Shorts. 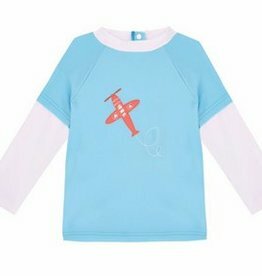 Little aviators will be set for the perfect travel adventure with this aqua rash vest with white sleeves and retro plane applique. Wear with our Airplane Swim Shorts. Our Liberty collection uses a classic Liberty print with an exclusive Sunuva neon twist. With its waterproof lining, this nappy pant is both adorable and practical. Looks gorgeous with our co-ordinating Baby Girls Liberty Rash Vest. Our Liberty collection uses a classic Liberty print with an exclusive Sunuva neon twist. This gorgeous white rash has a beautiful Liberty heart applique with neon pink stitching. 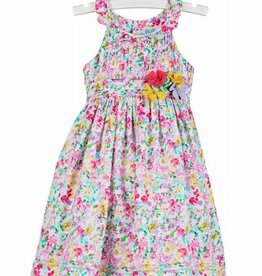 Looks perfect with our Liberty Floral Frill Nappy Pant. 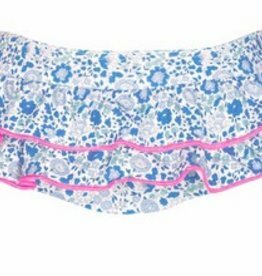 Our Liberty collection uses a classic Liberty print with an exclusive Sunuva neon twist which makes this pretty frill pant a beach essential for little girls and toddlers. Coordinate with the Liberty Rash Vest. 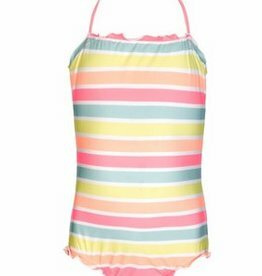 Our delicious sorbet stripe swimsuit looks good enough to eat in shades of soft sherbets for the ultimate beach chic look. Please note that the photo is not representative of the true soft neon colors. Pretty in pink! This sporty-chic bikini combines hot pink with contrasting white scalloped stripes. The perfect piece for beach adventures or lakeside lounging. 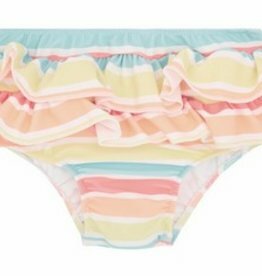 This frill nappy pant in pretty sorbet coloured stripes and with a waterproof lining is a stylish and practical holiday must have. Wear with the Sorbet Stripe Rash Vest for extra protection on the beach. 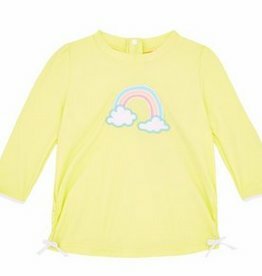 This soft yellow rash vest with a retro rainbow applique and white bows is simply adorable. 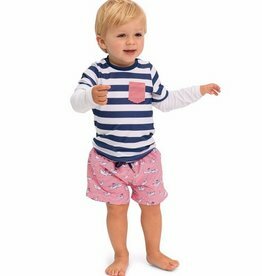 Looks perfect with our Baby Girls Sorbet Stripe Frill Nappy Pant. Practical yet adorable, these lightweight swim shorts are designed with an all over pelican print, creating a gorgeous design which is easy to pack, comfy to wear and quick to dry. Wear with the Boys Pelican Rash Vest. 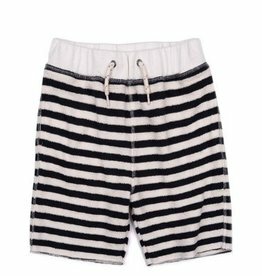 Were embracing classic simplicity with our collection of boys tailored swim shorts and these range design certainly perfects the poolside look. Ice cream scoops with super sweet sprinkles on the frills of this nappy pant with waterproof lining, are the perfect combo for hot summer days. Wear this with the Ice Cream Rash Vest for extra sun protection. 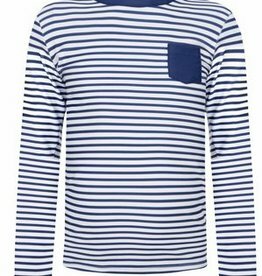 A classic, nautical inspired, navy and white striped rash vest with white sleeves and a red and white striped pocket – perfect for chic Riviera style. 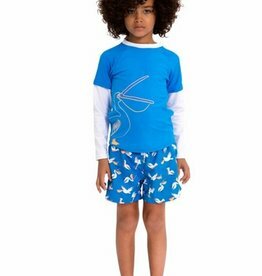 Wear with our Paper Boat Swim Short. Tights with polka dot, heart and floral patterns, an iconic Catimini design! Soft marl stretch fabric. Flat elasticated waist that does not squeeze baby's tummy. Comfortable gusset. Catimini signature on the sole.